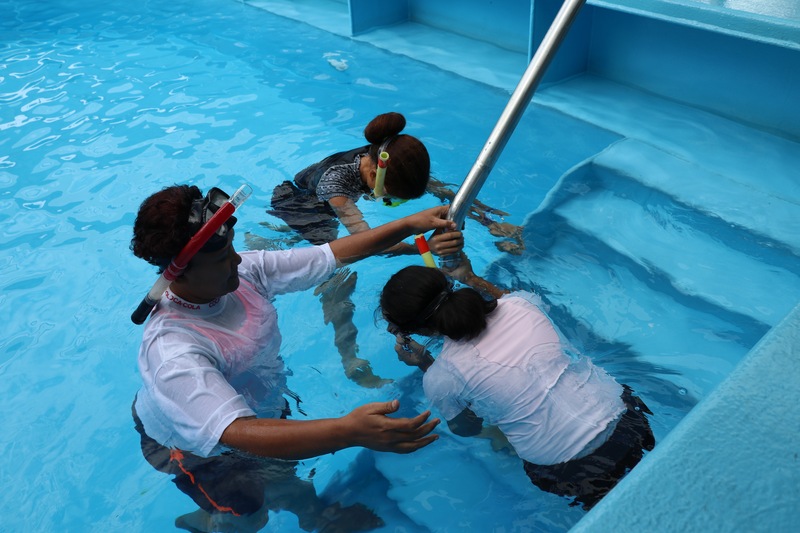 Last month we had the chance to begin a new program in Fiji. For those that don’t know, Fiji is like a second home for me. 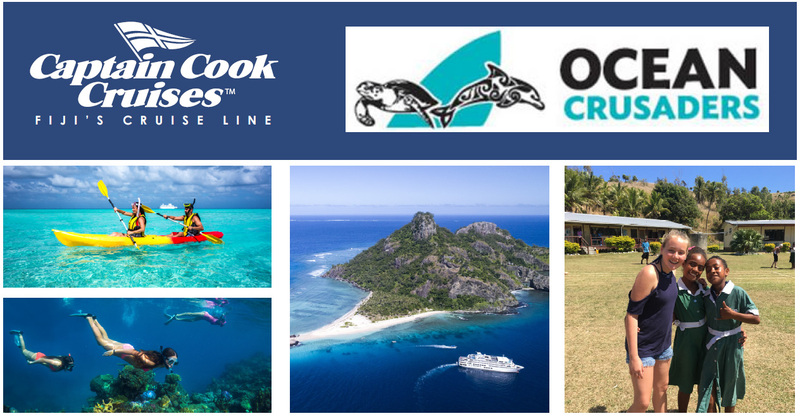 This was my 7th trip to Fiji and I spent 9 months there in 2001 when I ran charters aboard a 51ft yacht. For me, Fiji’s islands are as beautiful as every other island in the Pacific. What makes Fiji so great is the people. The warmth and friendliness, the laughs and smiles, it makes these people so special. When I used to run tours in Fiji we visited villages often. In 2015 when we sailed back through the islands as part of our Plastic in the Pacific trip, I noted a huge change. Gone were the pristine beaches and instead we found them covered in so much plastic. It seemed the locals had gone from cracking a coconut to have a drink then tossing it over their shoulder to doing this with plastic bottled water. In a place where recycling doesn’t really exist, we were providing them with so much plastic and no solution for it. So education is where we always start and educating youth has been the policy that Ocean Crusaders has been founded on. My thinking is that if we could educate the youth, they would educate their parents and then the words spreads. So we developed a competition for school children across Fiji. They were to go to their local beach and collect some debris to make a piece of artwork. They then submitted this to us and we put all entries up for a public vote. 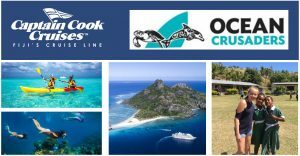 The winners of this public vote would win a 4 day cruise aboard MV Reef Endeavour, which was generously donated by Captain Cook Cruises Fiji. They would become Ocean Ambassadors for the future, to learn how to look after the oceans and how to teach others. In the public vote I was privately hoping we would end up with around 1,000 votes. Afterall no one knows us in Fiji. So it was a huge surprise when the votes came flooding in so quickly our website server crashed, we went over our bandwidth on our cincopa site and the votes just kept rolling in. A total of 103,819 votes later and we had our winners. On the night it closed I received a phone call from an excited teacher from Fiji who had said the students were so excited and schools were fighting each other to be the winners. We had created something that was a positive out of a negative situation. We also selected an Ocean Ambassador Leader from teachers who applied through a survey and interview process. We ended up with the most amazing lady in Merewalasi who teaches at Suva Adventist College. So the morning of the cruise and when we arrived to check in 2 hours before the cruise, it was amazing to see that already half of the students had already checked in. There was a lot of excitement, but a lot of nerves too. I think the parents were feeling similar nerves with several of the students being the first trip away from home without parents present. It really was an opportunity that Fijian’s rarely get. 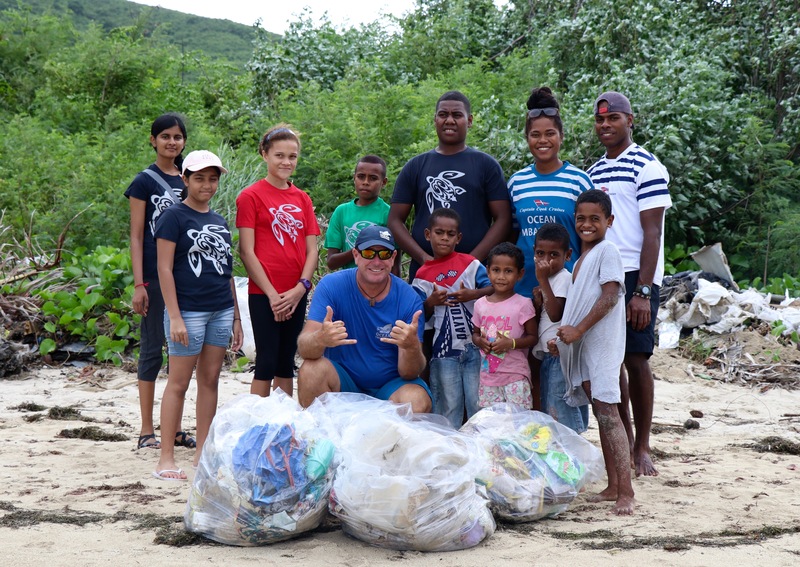 Over the coming days we conducted some clean ups with the on board Ocean Ambassador Vere. We conducted audits to find out what it was we were collecting and the students began to learn the issue. 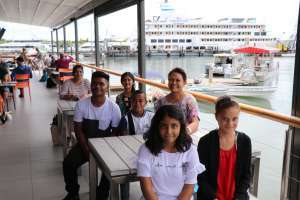 The students came from varying backgrounds with some coming from islands, others coming from large private schools and others from public schools. It provided a great mix of input. Whilst we were cruising, we conducted sessions in the Reef Room where we slowly made a presentation that these students could present when they got home, but before that, they had a chance to trial their new found skills by presenting to the crew and guests aboard the cruise. The students were nervous so they practiced and practiced. Finally the time came and sitting in front of them running the slideshow, they even surprised me. I think it was their best run through and the guests and crew were very appreciative. Many of them commented that they had learnt a lot and congratulated the students on a fine performance. Inside, I was full of smiles and feeling like a proud parent must when their child achieves great things. After that presentation I knew that this program would go well beyond the decks of this vessel. These students had so much talent and would take the message onwards. One thing I forgot to mention earlier is that we took them all snorkeling. Day one and they had to have lessons in the pool as none of them had ever done it before, including our leader Mumma Mere. Some of them could hardly swim and getting them into the water on day one was quite an achievement. On the final day, we could couldn’t get them out. They were lost in the beauty of what lies beneath and two of the girls even saw their very first shark. Needless to say I heard that they saw the shark and swam straight over only to miss out. On the beach that afternoon the students had a chance to relax and enjoy what they were going to protect. Sitting in the waters edge, playing on kayaks and laughing and talking, these students had come a very long way in a very short time. We couldn’t have been happier with the result. Returning to the mainland and I am sure the parents ears would’ve been hurting by the time they got home. From shy children, they were bubbly and excited and had show the greatest of respect for everyone on the cruise. Knowing these students have no gone back and presented to their own schools and after exams will look at presenting at other schools is such a good feeling.